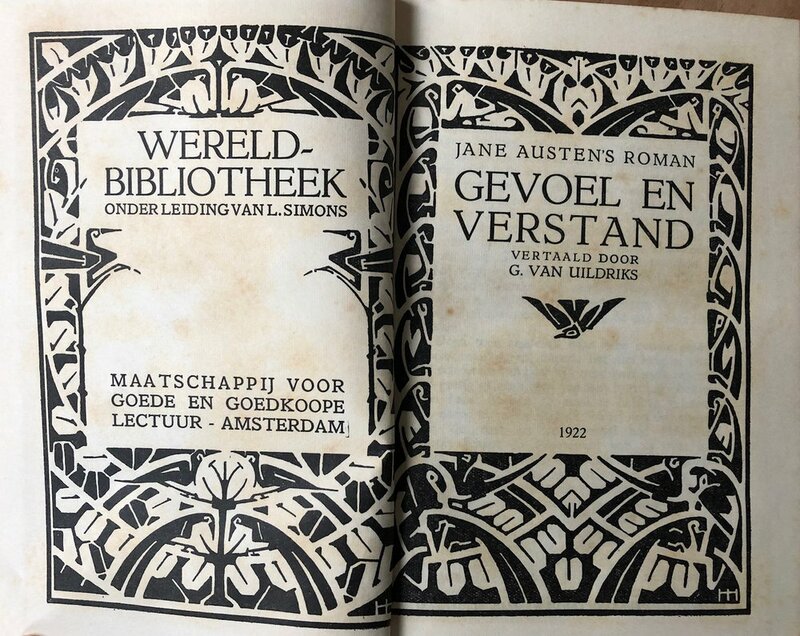 KARIN QUINT DISCUSSES THE CHALLENGES OF TRANSLATING AUSTEN INTO DUTCH. To read Austen in translation, or to read her in English? When you are, like me, not a native English speaker but you speak and read the language to a certain extent, it’s always a dilemma. For is it really possible to enjoy Jane Austen’s work when reading it in a translation? At the end of 2008, I started a forum for Dutch readers of Jane Austen. In the months that followed, visitors started debating all sorts of Jane Austen related topics. One of the most heated discussions concerned the Dutch translation of that very famous opening sentence of Pride and Prejudice. We almost settled on ‘Het is een universeel erkende waarheid dat een ongehuwde man in bezit van een goed vermogen, behoefte moet hebben aan een echtgenote.’ But then someone noted that ‘universeel erkende waarheid’ didn’t really sound right in Dutch, and the discussion started all over again. It may be hard to believe, but it took more than a century for Jane Austen’s work to be translated in Dutch. Sense and Sensibility was first published in 1922 as Gevoel en verstand (inexplicably switching the two prominent words in the title). For Pride and Prejudice it took even longer; that wasn’t translated until 1946, when it was published by a Belgian (Flemish) publisher as Trots en vooroordeel. But why did readers in the Lowlands have to wait so long? According to Dutch professor Suzan van Dijk from Utrecht University, who did research on why Jane Austen wasn’t read in The Netherlands in the 19th century, part of the explanation may be her use of irony, which was difficult for her Dutch contemporaries to understand. Let’s just say it doesn’t come naturally to all of us. Also, the lack of instruction and education of morals in her books made them unsuitable for young ladies in a predominantly Calvinistic country. Young ladies from The Netherlands did not read for entertainment. They read to learn about the pitfalls of life and love and the dramatic consequences of not being a good Christian. ‘Sense and Sensibility’ in Dutch. Credit: Karin Quint. These days Jane Austen’s appeal has been universally acknowledged even in The Netherlands. But it still seems very difficult to really capture her ironic tone in a Dutch translation. When you take a look at the different translations that have been made of Pride and Prejudice since 1946, you’ll see that every translator has chosen different words and turns of phrases for ‘It is a truth universally acknowledged …’, each time giving it a slightly different meaning. Not only Pride and Prejudice proves challenging, but also her other works, even the more serious Mansfield Park. When I read a Dutch edition of Mansfield Park from 1997, I suddenly realised that the inappropriate joke that Mary Crawford makes about ‘Rears and Vices’ in chapter 6 isn’t in there. I know it’s a much-discussed part of the book, and that even English-speaking scholars find it hard to interpret. But the Dutch translator chose to leave it out altogether. Because of that it’s a complete mystery why ‘Edmund again felt grave’. To be honest, I wouldn’t know how to translate it myself, but I still feel that just ignoring it altogether is lazy and doesn’t do Austen’s work credit. Even though the translations are not always what they should be, the Dutch have embraced Jane Austen’s work after all. And she’s here to stay. Her books can be bought in every well-stocked bookshop, often both in the original English version and in the latest Dutch translation. But which one to read? I always advise Austen newbies to start with the Dutch translation and read the English version not very long after that. This way you can start out by just enjoying the story without having to look up every word. When you then read ‘the real thing’, you’ll understand it better. I also recommend rereading Jane’s books regularly. Every time the translation in your head is a bit better than the last one and you discover something new because of it. Bonus: it’s great practice for your English language skills. The latest Dutch translation of Pride and Prejudice is from 2009 and I have to admit it’s rather excellent. But that opening sentence … I don’t know if there ever will be a translation I’m completely happy with. Although I’m rather proud of the one the members of the JaneAusten.nl forum made. After many discussions, we finally did settle on one translation to beat all translations. We were so very pleased with it, that we had it printed on T-shirts: Het is een onomstreden waarheid dat een ongehuwde man in bezit van een goed fortuin, op zoek moet zijn naar een vrouw. The successful translation! Credit: Karin Quint. The Jane Austen Literacy Foundation works with the Jane Austen community and industry to provide literacy resources for communities in need across the world. Reading and writing skills empower individuals to participate in society and achieve their dreams. Literacy gives a child pride and opens up a world of possibilities. Image credit: Karin Quint and Julia B. Grantham.